During the 1970s many haplochromine species – all with their specific micro-habitats and food-preferences – inhabited the Mwanza Gulf of Lake Victoria (e.g. Witte, 1981). 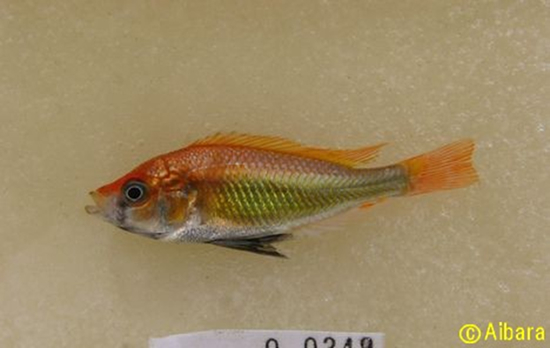 Among them was the zooplanktivore Haplochromis (Yssichromis) pyrrhocephalus that co-existed with some other zooplanktivores in the open waters of the Mwanza Gulf, where it was mainly found near the bottom at depths of 8-14 m during the day and nearer to the surface at night (Goldschmidt et al., 1990). 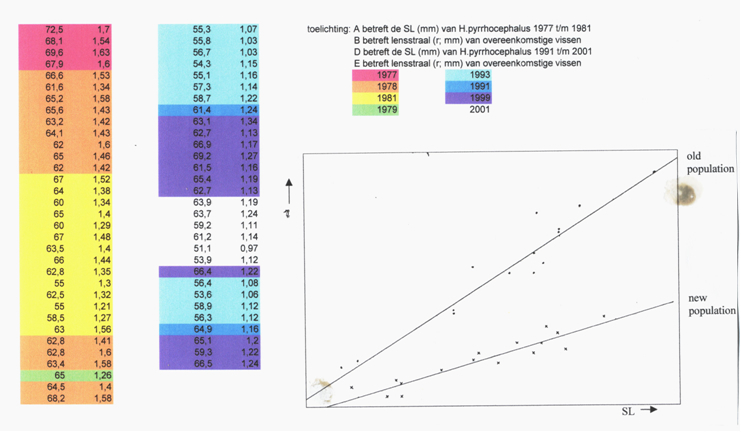 After the boom of the introduced Nile perch (Lates niloticus Linnaeus) and the concomitant eutrophication of the lake during the 1980s, practically all haplochromines disappeared from the sub-littoral and open waters (Witte et al., 1992). However, after a decline of the Nile perch in the 1990s, a number of haplochromine species reappeared, in spite of the still relatively high predation pressure by the remaining Nile perch and the decrease in dissolved oxygen (DO) concentrations and light conditions due to eutrophication (Witte et al., 2000; 2008). The first recovering species was H. pyrrhocephalus, which extended its habitat into regions of only 4 m deep (M. Kishe-Machumu, pers. com. ; Frans Witte and Jacco van Rijssel pers. obs.) and became the most common haplochromine cichlid of the Mwanza Gulf (Witte et al., 2000). In addition, H. pyrrhocephalus shifted its diet from zooplankton to insects and other larger and tougher prey (Van Oijen & Witte, 1996; Katunzi et al., 2003). Major morphological changes were observed in H. pyrrhocephalus. Some of these changes, like the increase of the gill surface and of a muscle responsible for pharyngeal biting force, seemed to be adaptations to the lower dissolved oxygen concentrations and the larger prey respectively (Witte et al., 2008). A decrease in head size, which could be an adaptation to escape Nile perch predation, was also observed (Witte et al. 2008; Chapman et al, 2008). More difficult to explain was a decrease in eye size, in spite of the decreased light conditions. Witte et al. (2008) suggested that the smaller eye size might be due to a trade off with the increased space needed to allocate larger gills in a smaller head, and they noted that the structure of the retina should be studied to conclude about the visual capacities. A preliminary study of the retina of H. tanaos indeed suggested changes that might be adaptive to decreased light intensities (Witte et al., 2005). The decreased light conditions would require an increased retinal sensitivity of the recovering visual predators (cited from Van der Meer et al., 2012). On the level of the photopic receptors, this would mean an enlargement of the cones at the cost of their density (Van der Meer & Anker, 1984), a common feature in growing cichlid eyes (Van der Meer, 1993, 1994). So, the reduced eye-size found in the modern population of H. pyrrhocephalus was unexpected in relation to the assumed visual demands. Retinal studies on H. pyrrhocephalus of old populations, however, revealed exceptionally large double cones (Van der Meer et al., 1995) and a spectral sensitivity shifted towards significantly longer wavelengths than in other investigated haplochromines (Van der Meer & Bowmaker, 1995). This suggested a “pre-adaptation” to the new light conditions (lower water transparency and a red-shift of the spectral composition; (Seehausen et al., 1997), which could have made the recovery of this species so successful. A decrease of the eye-size did not necessarily imply a reduction of visual sensitivity as the photon catching ability (PhCA) depends on cone-size and not on eye-size (Van der Meer & Anker, 1984). High PhCA enables a fish to detect low variations of contrast in relation to nearby objects (predator, prey or congener) against the background light. The higher the PhCA, the sooner a fish can respond, either by approaching or escaping the object of detection. In general, such detection is most profitable in a lateral direction. Therefore, the largest cones were expected to be located in the medial and rostral (as the eyes are slightly directed forward) regions of the retina. Detail discrimination is determined by resolution and of special importance in manipulating food particles. Therefore, the highest resolution was expected to be observed in the caudal periphery by which a detailed image can be obtained of objects directly in front of the snout. These expectations were also based on earlier retinal studies of haplochromine cichlids (Van der Meer, et al. 1995). Adult specimens of H. pyrrhocephalus were collected with bottom trawls in the northern part of the Mwanza Gulf of Lake Victoria. In total, 22 specimens were selected from the period of 1977-1981 and 22 specimens from the period 1991-2001.The fish were initially preserved in 4% formaldehyde solution (buffered with borax) and afterwards stored for years in 70% ethanol. The standard lengths (SL) of these specimens were measured (sensu Barel et al., 1977). 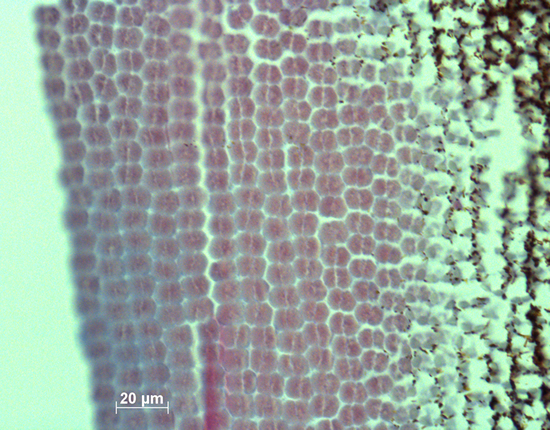 The eyes were isolated and the lens-radius (r) was measured using an eye-piece micrometer mounted on a binocular microscope. As not all eyes were suitable for sectioning, 13 specimens of the old population and 16 specimens of the new population were selected for further analysis. Whole eyes were dehydrated and embedded in paraplast using the position of the falciform process as a means of orientation. Semi-thin (5 mm) tangential sections were made on a microtome with a steel knife using a graduated location-device (Van der Meer & Anker, 1986) to determine the original position of the sections with respect to the falciform process which is always located caudo-ventrally. Accordingly, data were collected from 12 corresponding retinal areas, viz. the medial (4) and peripheral (8) regions of the dorsal, rostral, ventral and caudal areas. The size and angular density of the double cones in the twelve regions were registered for each fish. Measurements on similar retinal locations allowed us to compare individual specimens by mean values. Also the maximum regional values of size (Smax) and angular density (Hmax) were registered for each specimen, as well as their location. The size of the inner segments of the single cones Ss was measured in the regions where they were observed. In these regions the relation between the number of single and double cones (s/d) was registered. As in a perfect square mosaic s/d = 0.5, this value was referred to as 100% and the measured single cone occupation was expressed accordingly. 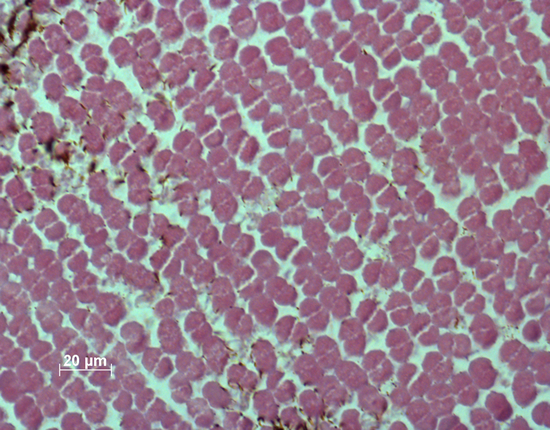 The mean value of Ss in each specimen was derived from the observed single cones, if any, in the entire retina. 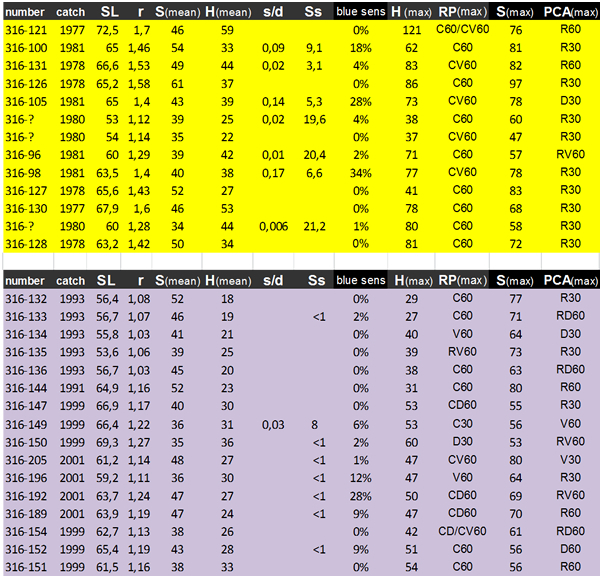 The mean value of s/d and the percentage of single cone occupation was derived from the measurements in all twelve regions, including the ones where single cones were absent. The mean SL of modern H. pyrrhocephalus was slightly, but significantly smaller (61.4 mm) than that of the old population (64.2 mm; ANOVA, P = 0.025). The lens-radius of the modern population (r = 1.21 mm) was also significantly smaller compared to that of the old population (r = 1.46 mm; P < 0.001). Due to a constant ratio between lens diameter and eye diameter (Matthiessen’s ratio; Otten, 1981) the lens radius would serve as a measure for eye size. The relation between lens-radius and standard length showed consistently smaller lenses in similar sized specimens of the modern population, indicating a significantly smaller eye-size compared to the old population. In 7 out of 13 specimens of the old population (54%) small single cones were sporadically observed in non-specific retinal regions. In the modern population, the inner segments or ellipsoids of single cones were never spotted. In 8 out of 16 specimens of the modern population (50%) relics of single cones, possibly the remains of their nuclei, were sporadically observed in non-specific regions. In the retinas of both the old and modern populations, the double cones were more or less irregularly set out in rows. In both populations, the highest densities of double cones were predominantly found in the caudal periphery, whereas the largest cones were mostly measured in the rostral part of the retina. The morphological data of the double cones concerned size and angular density. Since the angular density is a function of the lens-radius, its correlation with r has no significance. The Hd and Hmax (the latter in the caudal periphery) have significantly decreased in the modern population (with 28% and 33% respectively, P<0.001). Both the Sd and Smax of modern specimens with a small standard length (SL < 60 mm) tend to be larger compared to those of the old population (15% and 17% respectively), while Sd and Smax of larger specimens (SL > 60 mm) have decreased in the modern population(with 13% and 19 % respectively) which altogether results in a significant interaction. Estimated marginal means (EMMs) of both factors differ only slightly. In relation to the lens-radius, Hd and Hmax did not show a significant time effect, while for both factors there was a significant effect of eye-size (r) itself. Both Sd and Smax showed a significant interaction with EMMs differing only slightly. The retinal changes were in accordance with the environmental changes. However, there is some discrepancy regarding double cone size of the old H. pyrrhocephalus population from this study and that of the sample used by Van der Meer et al. (1995). 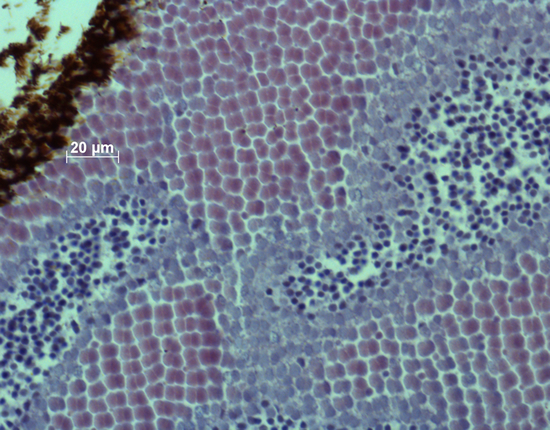 The larger mean values of the double cone size (52 µm2) in H. pyrrhocephalus of the old population as studied by Van der Meer et al. (1995) compared to those of the old population in the present study (45.5 µm2) may have several explanations. The specimens used in the earlier publication were super-exposed to light when caught, to make sure they were completely light-adapted. 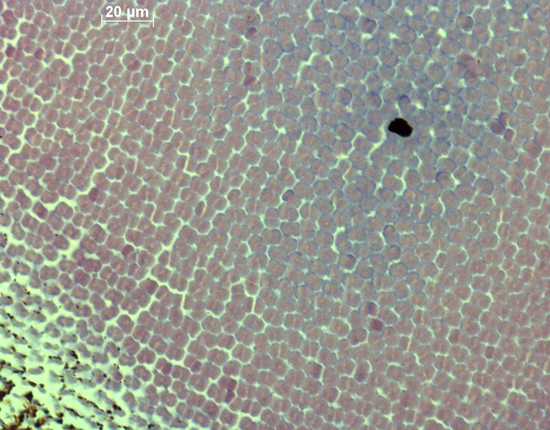 Moreover, the number of samples from one retina in Van der Meer et al. (1995) was much larger (over 30), thus affecting the balance between the retinal periphery and the major bowl for the benefit of the latter, where also the larger cones are located. Last but not least, the specimens (and their eyes) used in the study by Van der Meer et al. (1995) were kept in 10% formalin, only to be exposed to alcohol during a relatively short dehydration procedure. The specimens used in the present study were kept in alcohol for many years which may have caused more serious shrinkage of retinal tissue than mere dehydration would bring about. However, it should be stressed that in the present study the techniques used for both old and modern fish were identical, thus making the samples comparable. The observed reduction in eye-size in the modern population of H. pyrrhocephalus (Witte et al., 2008) was confirmed by the present data on lens size. As environmental conditions like low dissolved oxygen levels have a major influence on body shape and increase gill surface (Chapman et al., 2000; Rutjes et al., 2009; Crispo & Chapman, 2010), it is likely that hypoxia is responsible for the smaller eyes as a trade-off for larger gills as found in H. pyrrhocephalus (Witte et al., 2008). Even though the eyes have become smaller, the double cones remained of a similar size in the adult fish and so the presumed photopic sensitivity did not decrease. The reduction of the blue sensitive single cones agrees with the stronger absorbance of short-wave light due to eutrophication of their environment (Seehausen et al., 2003). The absence of functional elements of single cones in the studied sections does not imply their complete disappearance as became clear by the occasional remaining nuclei. It should not be excluded that in the modern population, the reduction of single cones was the result of elongation of their myoids (as in dark-adaptation; Ali, 1975), thus screening them from incoming light and reducing their function. Such a reversible phenotypic phenomenon, however, is not confirmed by earlier retinal studies of H. pyrrhocephalus raised in brightly illuminated tanks for several generations (Van der Meer & Bowmaker, 1995). The large double cones in the smaller eyes of the modern populations suggest a shift in retinal growth from addition to stretching of (cone)cells. The lack of a further increase of the PhCA by further enlargement of the cones as an adaptive adjustment to the darkened environmental light conditions, does indeed suggest a ´pre-adaptation´ due to the already large cones and long-wave sensitive photopigments in this species (Van der Meer & Bowmaker, 1995). The observed Smax in the medial and rostral regions of the retinas and Hmax in the caudal periphery are in accordance with the expectations. They seem to be characteristic for haplochromines of open waters. The retinal changes in the modern population may have been the result of phenotypic plasticity as observed in short wave light deprived specimens of H. fischeri (formerly H. sauvagei) in laboratory experiments (Van der Meer, 1993). The reversibility of the effect has not been tested. Based on molecular data, Mzighani et al. (2010) suggested that in the relatively murky Mwanza Gulf, modern H. pyrrhocephalus and H. laparogramma were not reproductively isolated, whereas they were in three other locations with clearer water. If the modern specimens of H. pyrrhocephalus were hybrids, this may have influenced the size of their double cones, as they were smaller in H. laparrogramma with the same SL (before the environmental changes, adult H. laparrogramma were larger than adult H. pyrrhocephalus; Van der Meer et al., 1995). As visual resolution primarily depends on the number of receptors per visual angle, the lower angular density in the modern population indicates a lower resolution in the modern population, compared to the old population before eutrophication. Since cichlids are known to be visual feeders (Fryer & Iles, 1972), the lower visual resolution agrees with the diet-shift of H. pyrrhocephalus from zooplankton to larger prey types (Van Oijen & Witte, 1996; Katunzi et al., 2003).